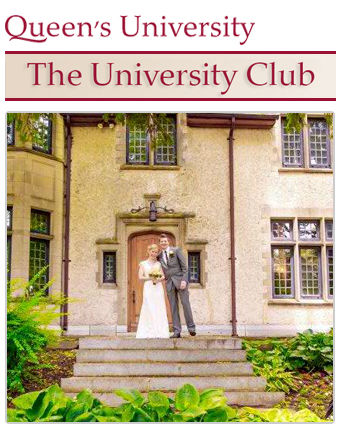 The University Club at Queen’s offers a unique venue for your special day. Situated in the heart of Queen’s Campus, minutes away from Downtown Kingston, the Club is located in a heritage building dating from the mid 1800’s. The landscaped gardens and lawns overlooking Lake Ontario, make an excellent setting for outdoor wedding ceremonies, plus a beautiful backdrop for photographs. It has charm as a relaxing place for your guests to meet and mingle for special memories. Indoors, the Club has a selection of elegant rooms that can cater for gatherings up to 125. The Club offers the convenience of an elevator for easy access to all areas. The Main Hall, The George Teves Room, has been completely renovated and features a modern décor which can make for an ultra-stylish reception and one to which the wedding couple can add their own personal touches. When it comes to menu planning, in addition to their suggested Catering Package, they are pleased to be able to accommodate your own specific choices and ideas. Their Event Coordinator, in partnership with their Chefs, would be most happy to meet with you to discuss your personal requests. They look forward to the opportunity of helping you make your special day a memorable and happy occasion.